Seven Seas Entertainment, 9781937867782, 192pp. "I Don't Want to Fall in Love...."
Freshly arrived in the Country of Hearts, Alice bounces from territory to territory in search of a stable home. She finally falls in with the Hatter family, a group of mobsters led by the seductive Blood Dupre. Yet Alice is shocked to discover that Blood looks exactly like her lost love from her home world. 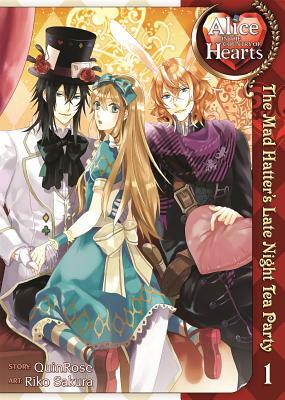 Can Alice see past the memory of the man she once loved and recognize the Mad Hatter for what he truly is? QuinRose is a Japanese game developer who created the Alice franchise of video games, which spun off into novels, manga, and an anime feature film.Riko Sakura is a Japanese manga artist best known for her work on Alice in the Country of Hearts: The Mad Hatter's Late Night Tea Party.